The Poem Farm: The Owl in the Door - Magic Everywhere! The Owl in the Door - Magic Everywhere! Students - Here's a funny little story for you. So, this past Tuesday I was leading a workshop for wonderful third grade teachers in Webster, NY. The middle school and district office building is one and the same, and it has beautiful wooden doors. Leaving the women's restroom on the third floor, I was struck by this marvelous owl you see above in wood grain. You do see it, don't you? Well, I decided I needed to take her picture. But there was a little problem. Another woman was in the restroom. What would she think? Who takes pictures in restrooms? There was no choice. I took out my phone/camera and snapped a few photos, mumbling excuses to the woman at the sink, "Um, I'm just taking a picture of this door. I know it's a little weird." I didn't explain about the owl; after all, she was busy washing her hands. I just took the picture. I heard her voice, "Oh, no. It's not weird." I wondered if she was backing away slowly, wishing was not trapped in a restroom with a strange door photographer. She was kind, but I hurried out, tucking my phone safely in my pocket until Wednesday evening when I looked at it again. Still an owl! So glad I took the photo. So glad I took the risk. Today's poem is written in quatrains, four line stanzas. I often write in quatrains, did so last week. But this week's poem was a bit more of a challenge, because instead of just rhyming the second and fourth lines of each stanza, I also rhymed the first and third lines. I have been thinking about rhyming like this for some time, and this week was that time. You might wish to look at the poem and find the rhyming words. Sometimes people mark such rhymes with circles or colors, to see the pattern. We call this pattern an ABAB pattern because just like in ABAB, the lines alternate in sound. 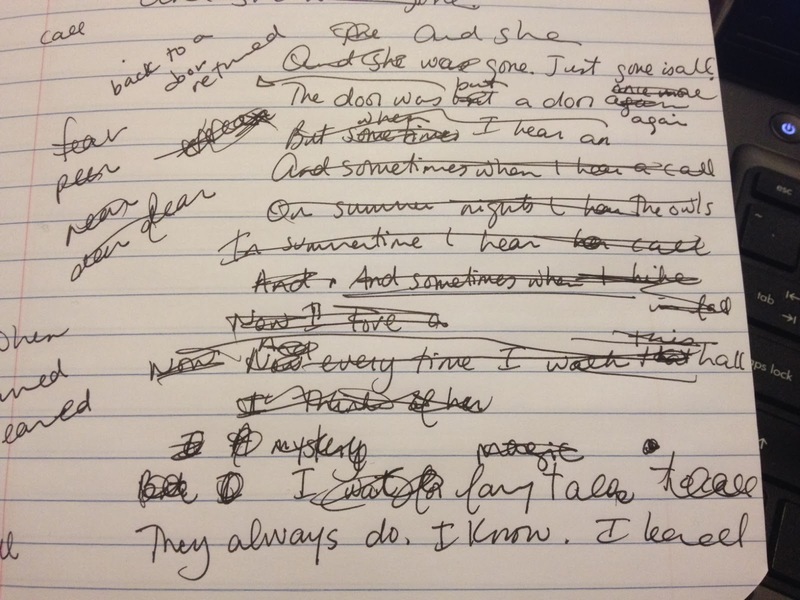 Sometimes a poem has more cross-outs in part of it than it has words. Such was the case with the last stanza of this verse. I simply could not decide how to end it. Finally, I did! 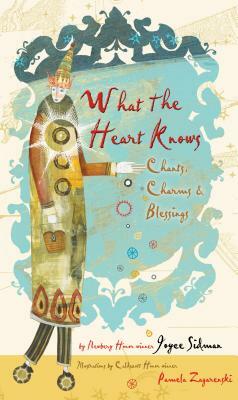 Many congratulations to Joyce Sidman for her newest reason to celebrate her newest book, WHAT THE HEART KNOWS: CHANTS, CHARMS, AND BLESSINGS. This book just won the prestigious Claudia Lewis Award, given by Bank Street College for "the best poetry book of the year." You absolutely, cross my heart, want this book in your collection. Renee is hosting today's Poetry Friday roundup over at No Water River. Swim over to her beautiful place and enjoy all of the poetic joy in the Kidlitosphere this week! HAHA! I love the restroom story - especially that the woman said "No, it's not weird" but added nothing else. What was she thinking? Our teacher showed us the picture of your writer's notebook yesterday. She saw it on FB. We like the bathroom story. We don't think it's weird at all. (Well, maybe some of us think it's weird). Thank you for sharing your process with us. Mrs. Johnson's fourth graders from Ohio. Amy, I love that you seized on owl folklore and ended your poem with the lines "Now I wait for magic's call./It's everywhere. I know. I learned." Magic is everywhere! Thanks for sharing! Methinks I'll be taking more time in the restroom now, knowing there are trapped souls in the doors. Goodness, what about the toilets? :) I LOVE the imagination you've brought to this poem, Amy, and the rhyme scheme makes it super fun to read aloud. Really well done, and a perfect match to that "weird" pic, too. Great little bathroom story. I do wonder what that woman was thinking. HA! I love the fairy tale feel of this poem, that magic, and the ABAB quatrain form. Thanks for sharing this poem. I need to look more carefully at the simple things around me. We live in a log home, with natural pine walls throughout, so I am constantly finding things (and parts of things) and just interesting shapes all the time. I definitely would have stopped to take that picture, too! Weird is in the eye of the beholder - or something like that. Do you remember my blog post "I Saw a Swon in Cupcake Badr" about this phenomenon? Paredolia is the term for the psychological phenomenon involving a random visual or auditory stimulus being perceived as familiar or meaningful, aka the face of the man in the moon. I love that you saw something in the wood grain of the door. Not at all odd to take a photo - glad you shared it with your poem! I love the third stanza, Amy. It taps into all those old myths (like Daphne's) where the hero/heroine is turned into a tree. "Now I wait for magic's call. It's everywhere. I know. I learned." What a fun story! The poem is delightful. You were very wise to take the photo of Mr.Owl. Very nice, Amy. Haven't we all had that experience of finding a face in the wood? I love the way you set her free!